This letter was written by Elhanan M. Mast (1832-1863) who entered the service on 1 June 1861 as the Captain of Co. C, 13th Ohio Infantry. 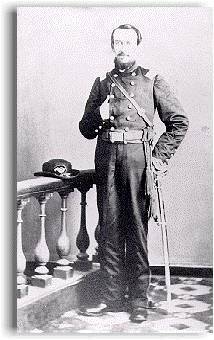 He was promoted to Major on 25 October 1861 and to Lieut. Colonel on 1 January 1863. He was killed instantly in the Battle of Chickamauga on 19 September 1863 while in command and encouraging the men of the 13th Ohio to hold their ground. Elhanan wrote the letter to his nephew, Joseph Mast Maitland (1838-1918), the son of James Madison Maitland (1815-1864) and Anna Mast (1813-1896) of Kingston, Champaign County, Ohio. 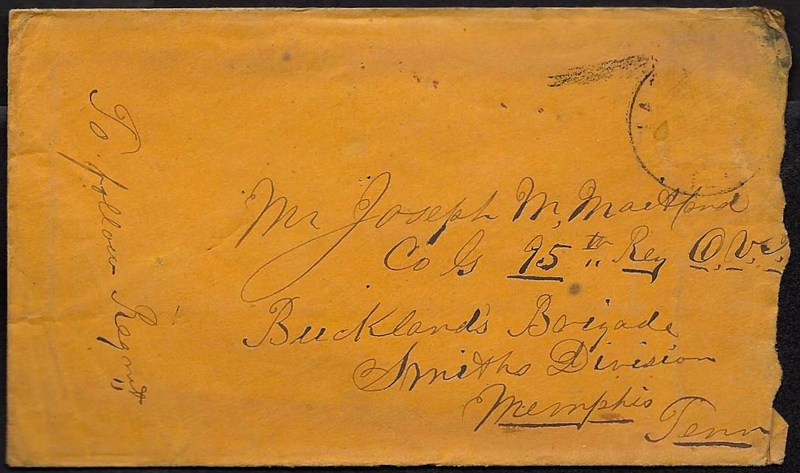 Joseph was employed as a school teacher prior to his enlistment as a corporal in Company G of the 95th Ohio Infantry. He rose to the rank of sergeant before being mustered out of the service. After the war he was married to Arabella Wharton (1844-1916). Your very welcome letter of March 23rd came duly to hand on Friday last. I was much pleased to hear of your welfare. It was so long after I had written that I had come to the conclusion that you had not received my letter at all. As you see by my caption, we are on Stones River. Our regiment, with the 59th O.V.I. have been here 3 weeks. We are on the Lebanon Pike about 6 miles from Murfreesboro, guarding the ford and at high water, the pontoon bridge. We are about 4 miles reinforcements on the extreme left of our army and half expecting to be “gobbled” long before this, but before that is done somebody will be hurt. I am sorry Jo that you did not join our regiment. I know now that I could have done you good, and in addition, I think you would have liked the service better here than down the Mississippi. We have seen nothing of the rebs since we came to this place although there is skirmishing on some part of our front almost every day. I am not anxious to see another such battle as the one we had on this river. Our troops here are in first rate health and fine spirits — all anxious to see the war over, but want it over upon honorable terms to the federal army. I do not know of a man in favor of the recognition of the C.S.A. I have not had a letter from home for some time. I have just written to your “paternal relative” [James M. Maitland]. As you say, Kingston is a dry place. I had a pretty good time for a couple of nights with Col. Armstrong & Capt. Cowgill who I met in Columbus. Apart from them, I had to depend upon Frank Eliz for fun. Joseph, how does Dan Coleman like the service? Does he think as much of a Darky now as he does of an Irishman? or has he learned which is the most profitable citizen? I think Negrophobia is played out with a good many. What say you? Jo, if you were here I could furnish you a horse to ride sometimes as I now have two. One is a gray pacing horse & he does his work nicely. The other is a little sorrel mare — not as large as Dr. Smith’s “Tom” — and as pretty as a picture. I just bought her today. I would like you to see him. She would suit any Miss in Champaign County. Guess I will have to send her home. Report of a gun on our outpost. I must see what it is. Good bye. Write soon as convenient and oblige. My best regards to all my friends in the 95th & elsewhere. This entry was posted on Thursday, November 13th, 2014 at 9:12 pm	and posted in Uncategorized. You can follow any responses to this entry through the RSS 2.0 feed.